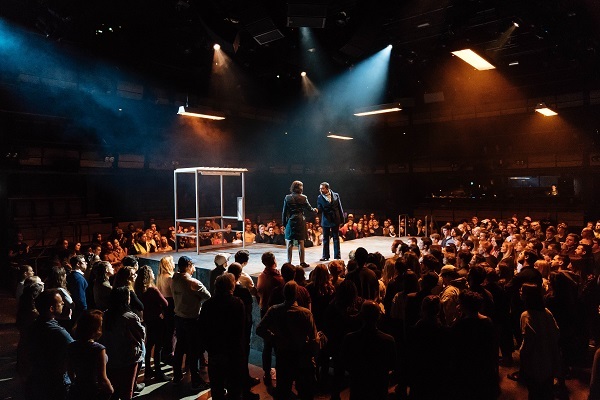 [London, UK] As Bridge Thaetre’s “Julius Caesar” audience member, for two hours, you live in a frighteningly constant state of uncertainty. One minute you are dancing to “Sweet Dreams”, and the other, on command by one of the actors, you are crouching on the floor, trying to cover yourself from the gun shots that kill Caesar (David Calder). You are standing in one corner of the pit just to be pushed aside by an actor and let the platform, which the stage consists of, rise in that place. You are told to chant Caesar’s name. You obey. During the funeral scene, an actor shoves Caesar’s portrait at you. You proudly hold it up. “Want to buy a cap to demonstrate your support for Caesar?” You are already handing in 4£. Your status of an audience member is reduced to that of a mere prop. Sides in the conflict are picked for you. There is no free will in this space. Hail Caesar! 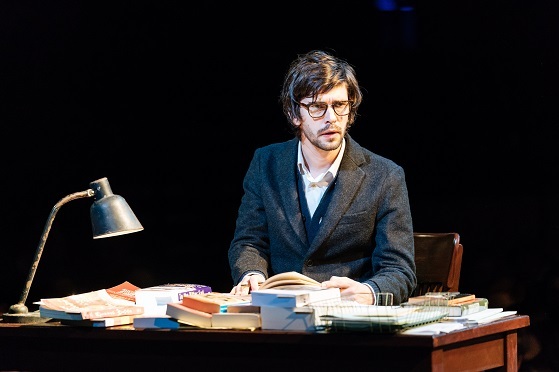 Nicholas Hytner’s staging of Shakespeare’s play hardly gives you time to think, not to mention that you get no chance to relate to one of the characters. But do you really need to understand Brutus’ (Ben Whishaw) hesitation, Cassius’ (Michelle Fairley) and Mark Antony’s (David Morrissey) cunning? No. What for? Just chant along! This experience is reflective of our everyday life: We no longer think, we only support. No matter who: government, opposition party or activist groups. Whoever is the most persuasive. Bombarded with propaganda, fake news, calls for action and new demonization theories, we are carefully manipulated to obey and protest, love and hate, trust and publicly accuse of falsification. No time is left to question the origin of such, seemingly our own, desires. Thus, even democracy becomes tyranny. The play is staged to remind of Donald Trump’s campaign, with Caesar resembling the US president. And the play conveniently reminds us that most so-called tyrants are essentially populists. Populists that enjoy genuine popularity, at that. Caesar is a collective image of every dictator known to the world to this day. Books scattered across the floor at Brutus’ flat hint us at their identities: Stalin, Pinochet, Franko. In light of last week’s Putin’s reelection in Russia with the biggest electoral support ever, this idea rings especially true in my mind. However, it would be a mistake to consider populism this staging’s main theme. Even when Caesar is dead, tyranny lives and prospers. The tyrant’s ghost commands the troupes and comes to Brutus in dreams. And here lies the staging’s main idea: Violence can never be defied with more violence. No matter the cause. Literature demonstrates it. History proves the fact. 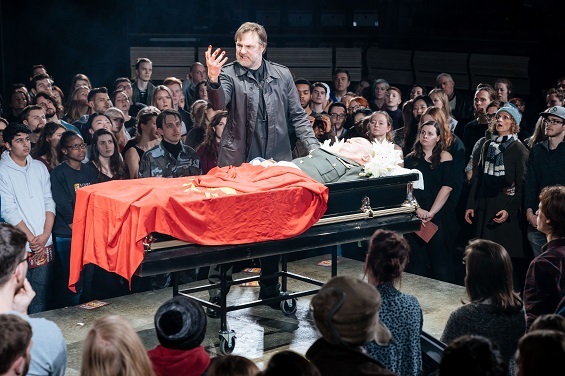 And Bridge Theatre’s “Julius Caesar” attempts to get this point across to its audience. The life will show if we can learn from such theatric social experiments. Karina was the Editor-in-Chief of Lennon Wall magazine from 2016 to 2017. During her term, Karina managed and supervised all day-to-day operations of Lennon Wall magazine. She was responsible for content planning, overseeing production of both print issue and online publication. Karina edited and reviewed all articles and photographs for accuracy, while continuing to write feature stories for the magazine.